ProGo is a set of quick cutting titles tools that allow Final Cut users to easily create energetic promotional videos. ProGo features drop zone, color solid, and gradient presets with a variety of background and text animations. Instantly edit incredible fast-paced videos by simply stacking ProGo presets and changing the text. ProGo is a Final Cut Pro X exclusive plugin. ProGo provides Final Cut Pro X editors with quick cutting effects for high paced dynamic videos. Edit to the beat with incredible ease using ProGO’s simple user interface. Start by placing a ProGo preset above any background in the FCPX timeline. Next use the drop-down menus under animation controls to determine how the next scene will animate in. Start by placing a ProGo preset above any background in the FCPX timeline. If you selected a drop zone preset, insert media into the drop zone. If you selected a color or gradient preset, choose a color scheme as your background. Next use the drop-down menus under animation controls to determine how the background and text will animate in. ProGo features fixed animation speeds and simple drop-down menus that allow users to quickly change animations. Choose from over 20 text animation methods including tracking, sliding, and flying. 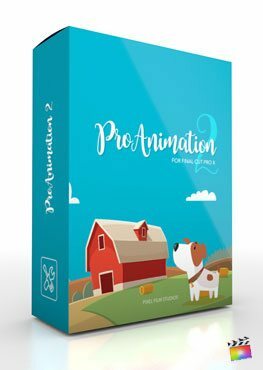 Choose from 6 background animation methods including sliding and zooming. ProGo features both regular and motion blurred animation options. Motion blurred presets simulates the blurring effects that occur when shifting a camera too quickly. These presets take a little longer to render but make for a more cinematic look and feel. With non-motion blurred presets, users can enjoy faster render speeds with the same customizable options. I installed ProGo and see a red screen similar to this. Where do I find ProGo? Once the installation is complete, you can find ProGo in the FCPX Titles library. Where is the tutorial for ProGo?